Jenifa in London saw it’s final curtain call at The Lighthouse Hall in London last night. It was the closing night of the movie; Jenifa in London which fans and critics have given a 10/10. Funke Akindele Bello looked stunning as she arrived on the red carpet of another sold out Premiere. She made sure she addressed the audience before the movie started & thanked them for their continuous support & yet another sold out night in London. 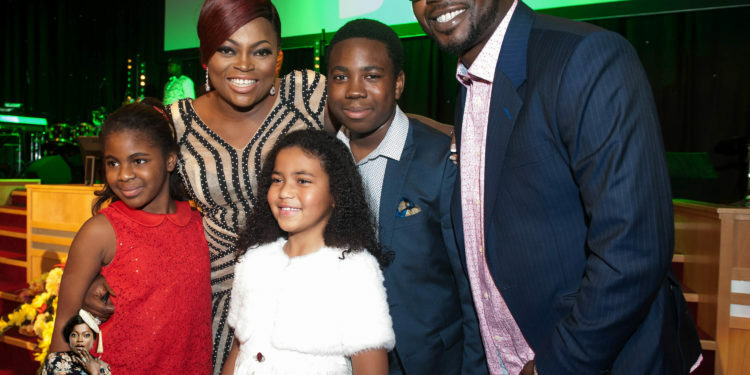 Just like the opening night, Jenifa in London produced waves of laughter throughout the auditorium. Tunde Babalola of Phoenix Media; the engine behind all three Jenifa In London Premieres, was not surprised with how well the movie was received by the UK, he went on to thank Media Partners such as Nollywood Movies, BEN TV, DJA Media, Spotlight Ent, Cokobar & Funmi Ogunja Media for their contribution to the success of all three Premieres. After Funke Akindele Bello and the cast of Jenifa In London took their final bow, The Great Legendary Sir Shina Peters took to the stage for a surprise performance. Sir Shina Peters was joined on stage by Funke Akindele Bello & husband, he also had the entire audience on their feet.